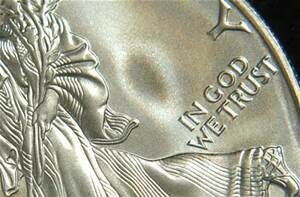 “In God We Trust” . . . . . . . . . . All others – pay cash! Does that sound remotely familiar? ‘My God, I put my trust in you’. Where have we heard these words before? I kept thinking about it all week because it sounded so familiar. And then, on my daily quest to Dunkin Donuts for my morning coffee, it hit me! For on the quarter I was about to spend were the same words, but with a corporate meaning, the Words, ‘In God We Trust’. And I really started to wonder “Do we?” Do we as a people truly trust in God? And if we do, what do we trust him for? The history of our national motto goes back to the Civil War when certain evangelical pastors were convinced that if the Union was dissolved into oblivion, wouldn’t it be horrible if the final vestige of our existence, (our coins), said nothing about who we were as a people. They worried that historians digging up the remnants of our country would think us a heathen nation because all we would have to show for ourselves would be the goddess liberty on some of our silver dollars. That is how the words ‘In God We Trust’ came to be adopted on our money in 1861 and as our national motto in 1956. What do you suppose he meant by that? Did he have some discomfort with human nature? Perhaps here was a person who had been truly burned by his fellow man. At any rate, I dug up the $15.46 and paid the man. Both of us went away happy, me with my new hammer, and he with something he could believe in, something he could take to the bank, our nations currency. Well you might be wondering, what is the point of all this? The point is that for those who truly trust in God, there are no limits to one’s existence. The worries of today come and go, but God is still with us. The current conflicts in the middle-east and its fallout in Europe, and here, at home is worrisome for many, horrific for some, and yet our faith is continually strengthened because of our Trust in God to see us through it. Unfortunately though, our nation today is not a nation of faith, (you can tell by all the dribble we put out as entertainment), but thank God for us that at least a few of our people are people of faith. Because that is where the true strength of America lies. We are a people descended from the sons of Noah, a remnant of a race gone very bad. Who were so bad, as the story goes, that they were all swept away by a flood that was sent by God to destroy the entire earth, and everything in it. And only a few survived; saved by the very water that destroyed all the others. This is God’s work in the world. This is God’s will in our lives, that Christians should be spared, as Paul proclaimed . . . ‘for whether we live or whether we die, we are the Lord’s possession’. God made a covenant with his creation that He would never do this again and he sealed it with his rainbow. We read the story about this in today’s first reading. Then God made another covenant with us that we would never die and he sealed it with his own blood. We read about this in the second reading. My question to you is, do you trust God? Do you trust God to keep his promise to you that you will be saved? Do you trust in His Spirit to forgive you your sins? Do you trust in His Son, Jesus, the Messiah, to be Lord of your life? These are the very hard questions that all of us should be asking ourselves as we begin this Lent. Just how serious is your faith? It used to be that people gave up things that they liked for Lent. I remember a friend in my youth who said he liked wine, women and song . . . so he would give up singing. Many of us have the same silly notions of what we can do as penance in our lives. But rather than subtracting something you like from your life, I would suggest to you that this may not be the time to take away the good things that you enjoy, but rather to add something you wouldn’t normally do. One way that I have been thinking about, this week, is to write a letter to your family about all the things that they have meant to you but that you never had the time to say. Address it to those you love and put it with your papers so that one day, when you are called home, your family will have a last word from you that is full of your abiding love. Another thing you can do is to make an effort to do penance. Some years ago, when my son Ethan was enrolled at 14 Holy Helpers School, I had a chance to speak with a catholic monsignor about the Sacrament of Penance and how I wanted Ethan to join with his class for their first penance. After some discussion in which I shared with him the information that our church also has the ministry of penance and reconciliation, Monsignor agreed to let Ethan continue with his Roman Catholic schoolmates. After Ethan started taking penance classes, it came to me that we Anglo-Catholics are really missing out on something by ignoring our own rite of reconciliation. Many of us go through life with a lot of baggage that has built up over the years; things that we are sorry for, hurts we have caused, things that never really seem to go away, regardless of how many times we have confessed them and have been absolved. It seems like they just stick like glue. I hope you know that you are welcome and even encouraged to come to private confession if you need to. Confession may sound a little too Roman Catholic for most of us, but there are things we can do to help ourselves. One way is that you do not explicitly need a priest for confession. What you need is trusted friend. Although a friend cannot absolve you, he can declare a statement of forgiveness. I have heard only two confessions in all my years as a clergy person. Both were life changing experiences for those I heard it from. The other thing you can do is to write a letter to God. By putting into words the things that we are sorry for, the things become for us somehow more real and tangible. When you are finished, seal the envelope and ask some one to pray with you while you burn it. This may sound strange, but it is an uplifting experience of freedom to know that God has accepted you in your weakness and has forgiven your sin, never to return again.